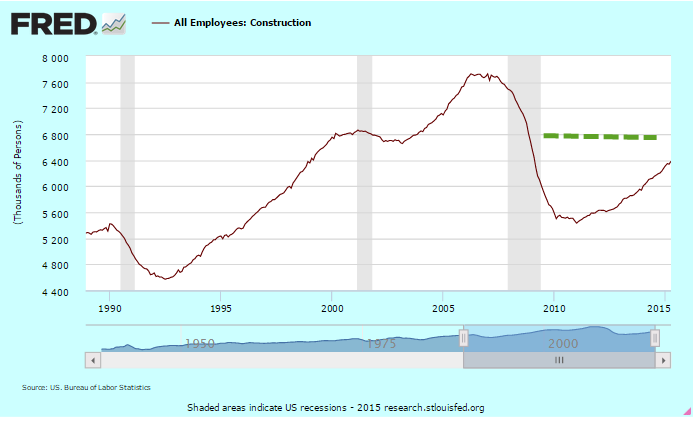 Although the unemployment rate has fallen below 5.5%, the labor participation rate is still rather low and wage growth is slow, prompting renewed calls for government stimulus. A 2010 article laid out the justifications for more government borrowing to spur the economy. Let’s review a few points made by these economists. The nature of money and the government’s relationship to money is certainly beyond the scope of a blog post. In short, money in all its forms is a claim. A central bank (called the Federal Reserve in the U.S.) is a government created institution which regulates and administers the supply of money and credit within a country, and manages the reserves of foreign currencies held within that country. It acts as the government’s banker and is the lender of last resort both to the public and the government. If the public will not buy all of the debt issued by the Treasury of a government, the central bank steps in and buys it, a practice known as “printing money” although there is no new money printed. In a fiat (unbacked by any hard metal or asset) money system, a sovereign government has the power to create and destroy money claims at will. As the 2010 article notes, all taxation is a destruction of money. A $100 tax voids a taxpayer’s ability to make a $100 claim for some good or service. A thief takes money with no promises. A government takes money with some implied promise or threat but no exchange of value at the time of the taking. Taxation is not an exchange, but a taking, a destroying, like letting a little bit of air out of a balloon. As long as the government pumps in the same amount of air that it took out, the size of the balloon changes only in proportion to the change in population. Various economists in this article asserted that the government should pump more outside air into the balloon, which will cause the economy, the molecules inside the balloon, to speed up. Is there any limit to the amount of outside money that a government can pump into the balloon? If a government can make up money out of thin air, why not just give $100K to each of the 300 million citizens in the U.S.? People who couldn’t afford a newer car could buy one, which would boost the sales of car manufacturers. New homes, new appliances, vacation trips – a shot in the arm for so many industries. Unemployment would practically vanish. Imported goods into the U.S. would soar, helping the workers and businesses in other countries. People could pay off their credit card and student loan debts but banks might suffer because not as many people would want loans. Stock prices would soar in value as families searched for a place to invest some of their windfall. People who had already owned stocks and other assets before the boon would see their net worth increase exponentially. Housing prices would climb as more people could afford to buy a house. What about inflation? 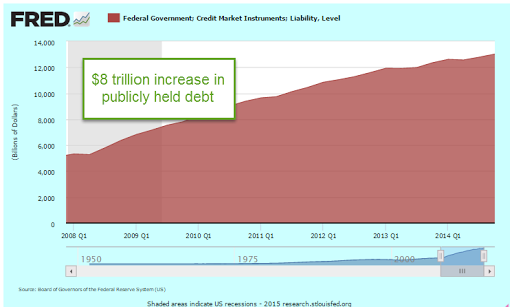 Well, the government has already pumped in $8 trillion since the recession started in late 2007. $8 trillion divided by a 300 million population is almost $27,000 per person. Contrary to predictions of runaway inflation, it has been moderate or below the 2% target rate. In fact, if we use the method of calculating inflation used in the Eurozone, we have had deflation in the first quarter of this year. So any inflationary effect from a one time $100K boon would be less than disastrous. Even if inflation climbed to a 1990s level, about 4 – 5%, what is the harm? Most of us instinctively look at this scheme, furrow our brow, and get suspicious. But why? Why can’t a government with a fiat money system simply create heaven on earth? Stay tuned till next week…. 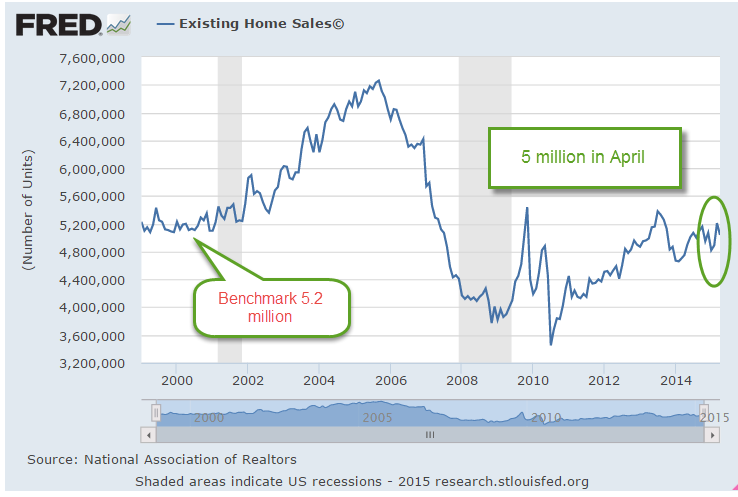 Existing home sales of just over 5 million (annualized) in April were a bit disappointing. Since the recession, there have been only about six months that sales have been above a healthy benchmark of 5.2 million set in the late 1990s to early 2000s. When reporting first quarter results, many of the big multi-national companies in the Dow Jones noted that sales had declined in Europe. The broader stock market, the SP500, has not had a 5% decline for three years and is due for a correction. Greece is likely to default on their Euro loans in June. Combine all of these together and some pundits predict a 30 – 40% market correction this summer and/or a recession this year. Corrections can be overdue for a long time. Some treat the stock market as though its patterns were almost as predictable as a pregnancy. Here’s an early 2014 warning that finds a chilling similarity between the bull market of today and, yes, the one before the 1929 crash. Bull and bear markets tend to confound the best chart watchers. 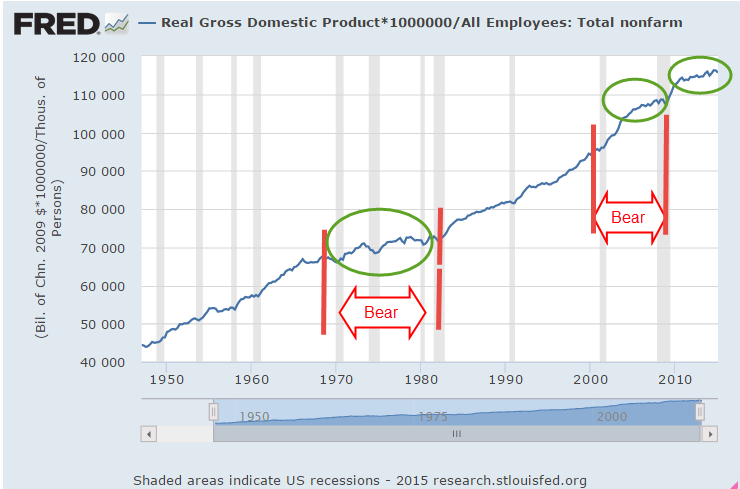 The bear market of 2000 – 2003 was not like that of 2007 -2009. Some argue that market valuations are like a rubber band. The longer prices become stretched, the harder the snapback. However, the data doesn’t show any consistent conclusion. The 2003 – 2007 bull market ran for 4-1/2 years without a 5% correction. That one didn’t end well, as we all know. 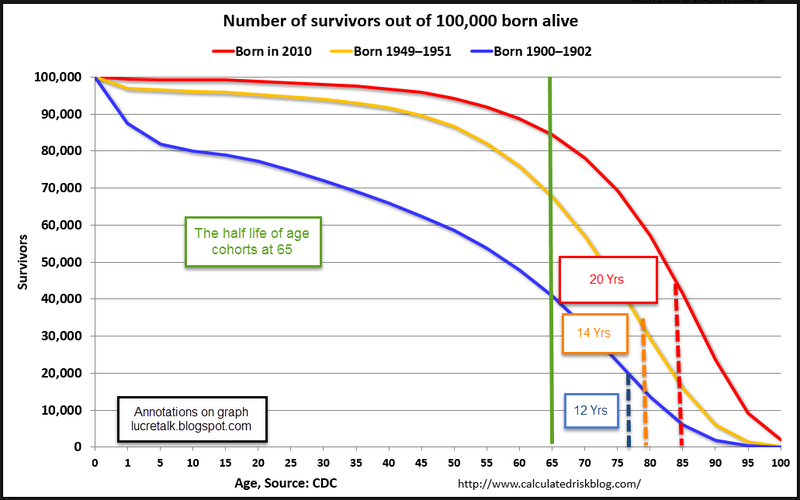 The mid-1990s had a three year stampede from the summer of 1994 to the summer of 1997 before falling more than 5%. After a brief stumble, the market continued upwards for a few more years. Turn the dial on the wayback machine to the early 1960s for the previous stampede, from the summer of 1962 to the spring of 1965. That one ended much like the 1990s, dropping back before pushing higher for a few more years. These long runs occur infrequently so there is not much data to go on but the lack of data has never stopped human beings from predicting the end of the world. April’s Leading Economic Indicator was up .7%, above expectations, but this increase was helped along by an upsurge in building permits. This series has been unreliable in predicting recessions and its methodology has been revised a number of times to better its accuracy. 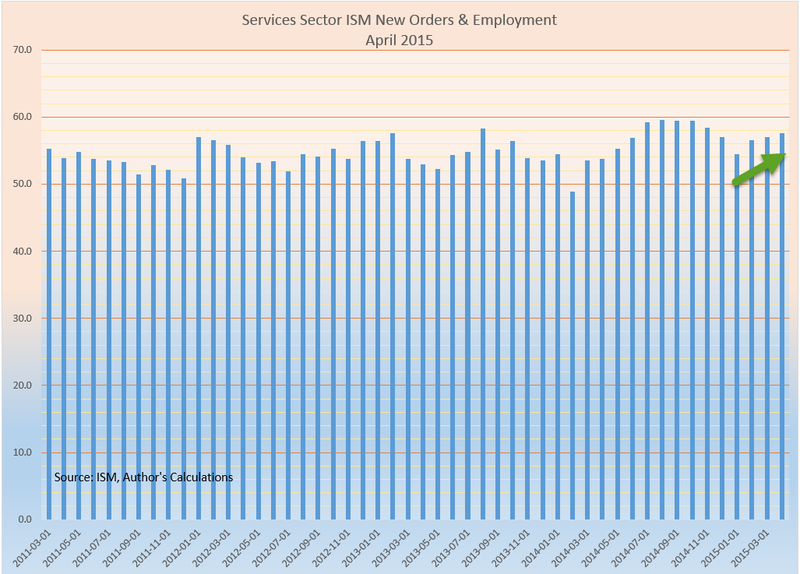 Doug Short does a good job of tracking the history of this composite and here is his update of April’s reading. 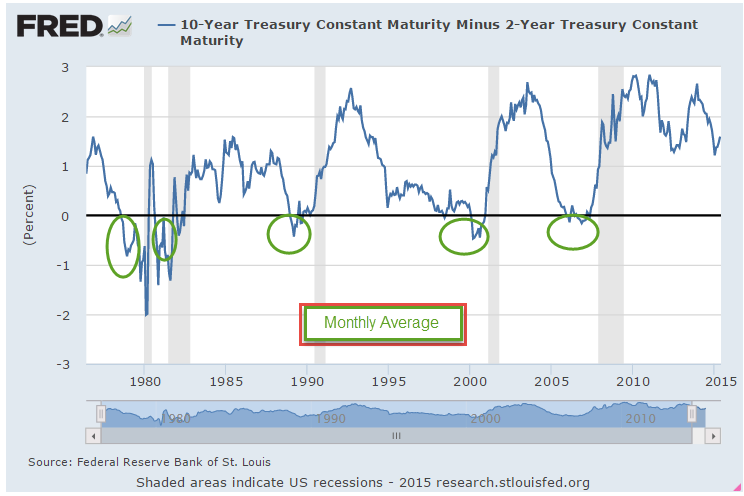 A much more consistent indicator of coming recessions is the difference in the interest rates of two Treasury bonds. The time to start thinking about recessions is when the 10 year interest rate minus the two year rate drops below zero. 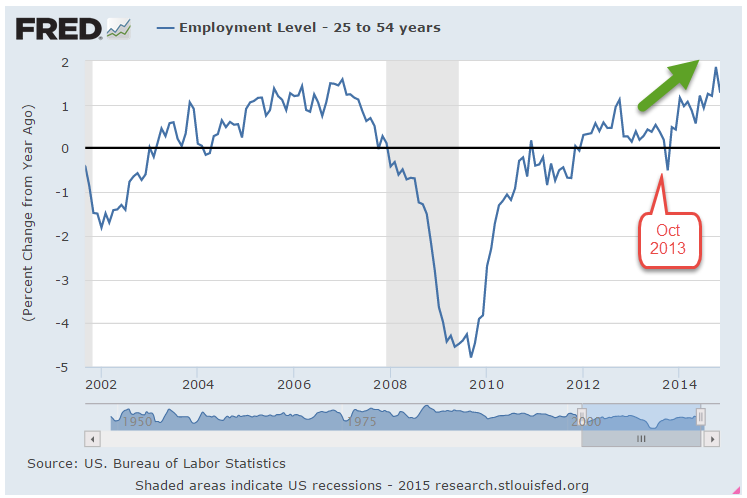 The current reading simply doesn’t support concerns about recession in the mid-term. The first estimate of GDP growth in the January to March quarter was almost flat. Not a big surprise given the severe winter in the eastern part of the U.S. but an annual rate of just .2% growth was lower than most estimates. It would be a mistake to attribute all of the slow down to the weather. Lower gas prices have delayed new drilling projects and idled more costly operations. Some economists have not fully appreciated the positive influence that shale oil drilling has had on a tepid economic recovery. 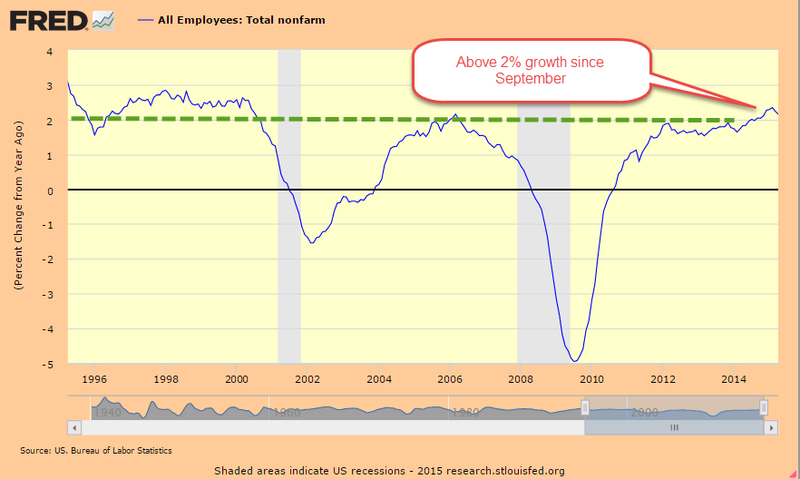 Growth has not only slowed. It has shifted lower. The Shiller P/E ratio, or CAPE, uses a 10 year period as a base. A common measure of inflation expectations is the 10 year Treasury bond. 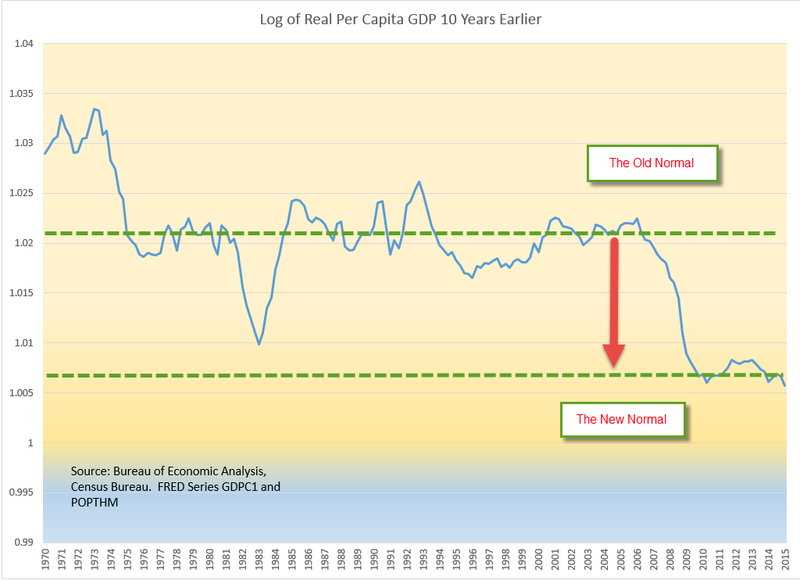 Let’s look at the change in real per capita GDP over rolling ten year periods starting in 1970. 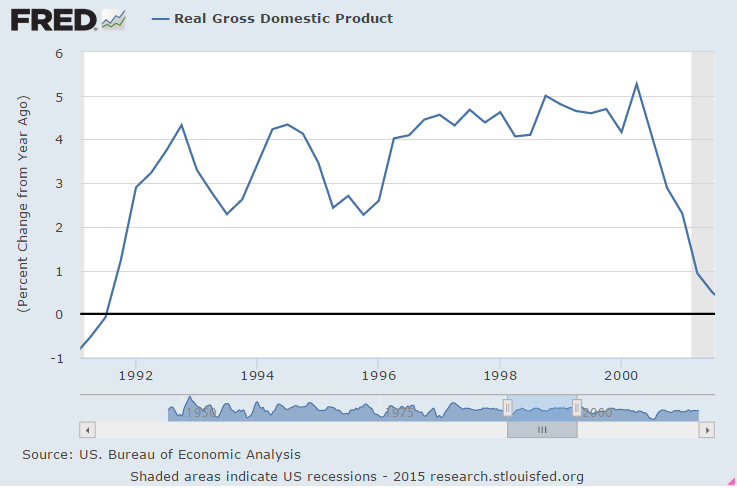 Below I’ve graphed the logarithm, or log, of current GDP using the GDP 10 years ago as a base. 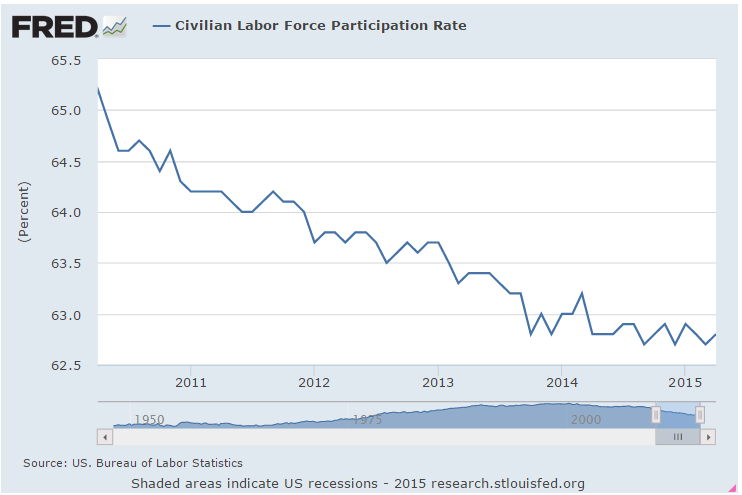 We can see a fairly consistent trend over forty years until 2008. Some economists build models – partial derivatives – in which quantity of output fluctuates as a function of price, or F(p). The thinking goes that price changes are part of a self-reinforcing mechanism. The problem is that price is a reaction to events, not a cause of them. Prices distribute the effects of changes in supply, demand, and expectations in an economy or market. 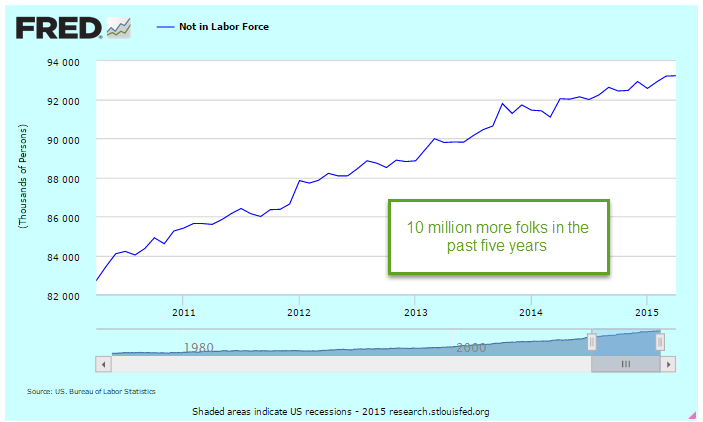 The Fed believes that the economy has too much inventory – of savings, of caution. Just as any store merchant would do, the Fed has lowered the price of savings, the interest rate, in the hopes that customers will come in and borrow some of that savings. Blue light special in Housing, Aisle 3! The sale has been going on for almost seven years but demand in some sectors, particularly housing, is still very low. 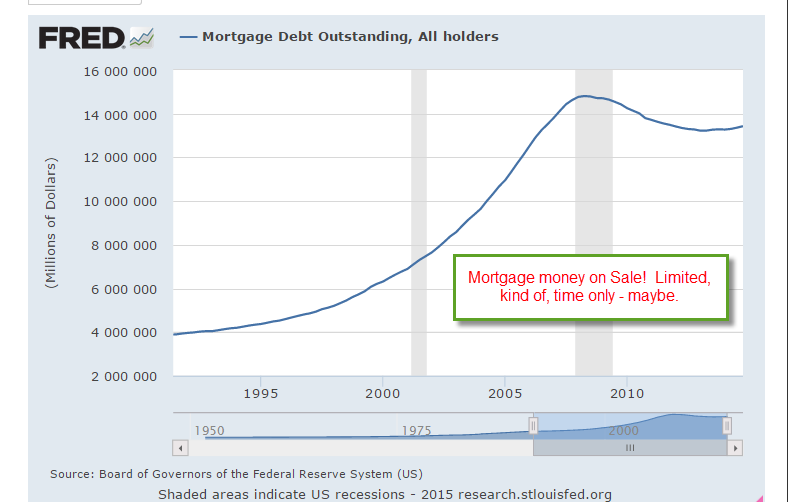 The total of outstanding mortgage debt remains subdued no matter how much the price, or interest rate, is lowered. 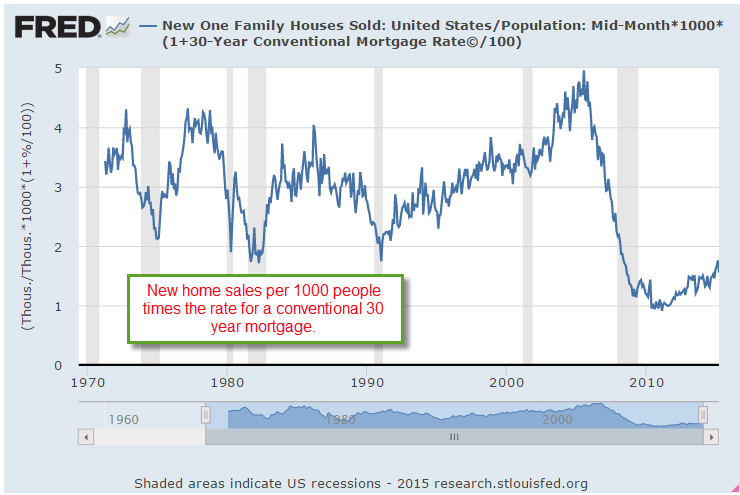 Last week I showed a chart of new home sales per 1000 people. I’ll overlay the thirty year mortgage rate over it. 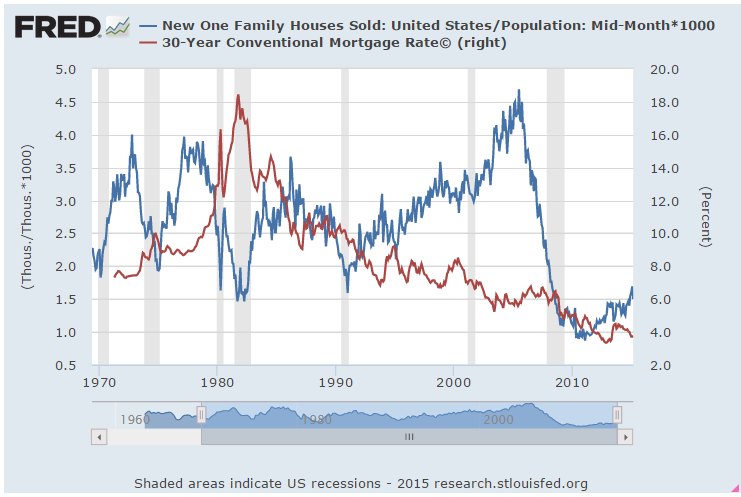 Higher mortgage rates reduce the demand for new homes. The exceptionally low rates of the past few years should accelerate the demand for new homes. 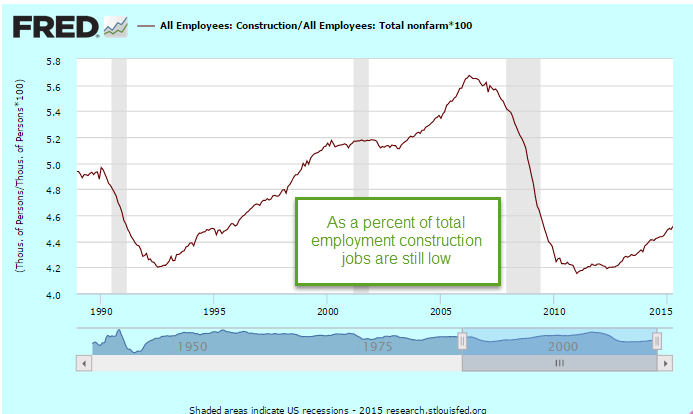 Let’s do a quick and dirty adjustment by multiplying new home sales by 1 + the interest rate. This will have a greater effect on sales when interest rates are higher, helping offset the lowered demand. The actual amounts are not relevant- it’s the comparison. 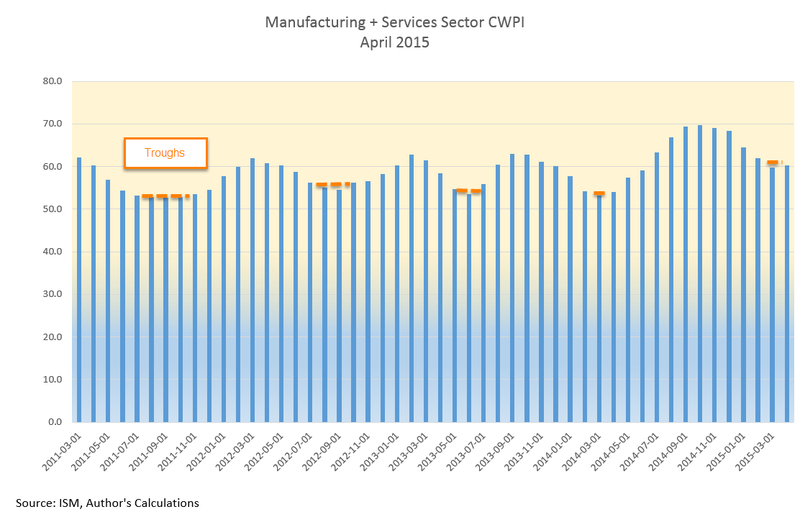 This chart shows the exceptionally low demand of the past several years. 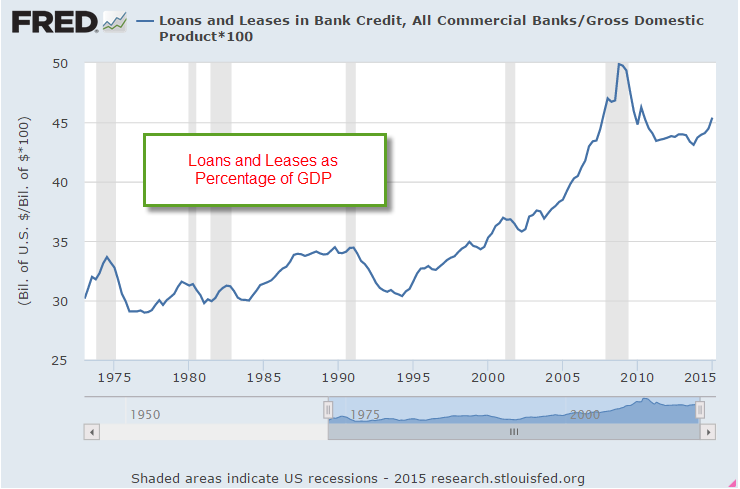 The total of loans and leases has been growing about 2% annually on average since the end of 2008, from $7.2 trillion to $8.1 trillion, a total of a little over 12% during the period. To put that in perspective, that total grew by 75% in the previous 6 year period 2003 through 2008, rocketing up from $4.1 trillion to $7.2 trillion. 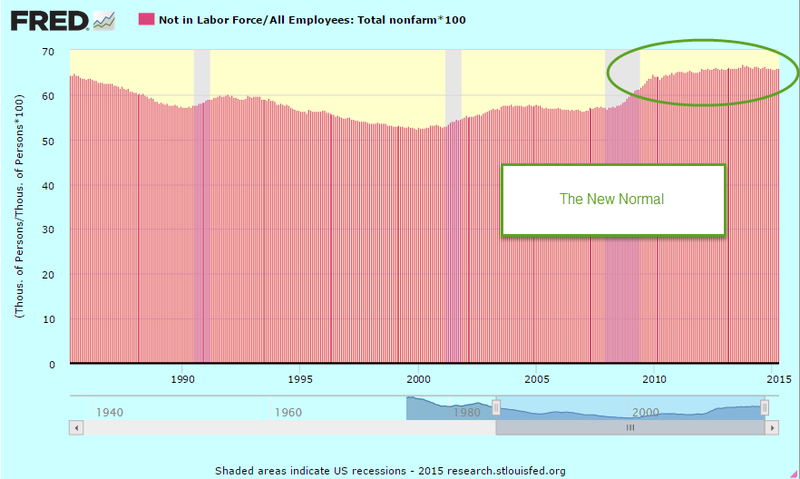 Since 1995, our economy has shifted and has been running on borrowed money more than in past decades. These loan totals don’t include the huge, no strike that, call it prodigious, government borrowing that has propped up GDP growth in the past dozen years. Even if conditions do meet labor market and inflation targets, the Fed wants to make sure they can stay stable at those targets for a few months before taking action on interest rates. The sale has been going on for so long now that the anxiety over the end of the sale has acted as a counter balancing force to the sale price. Models of thinking as well as patterns of behavior are habit forming. One of the greatest scientists of all time, Isaac Newton, continued to believe in the principles of alchemy until he died. Like other central banks, the Fed believes in the alchemy of interest rates, the price of money – that they can turn a leaden economy into gold.